Women's Original Cardigan Knitted Cuff Tall Boot Socks is rated 4.1 out of 5 by 16. 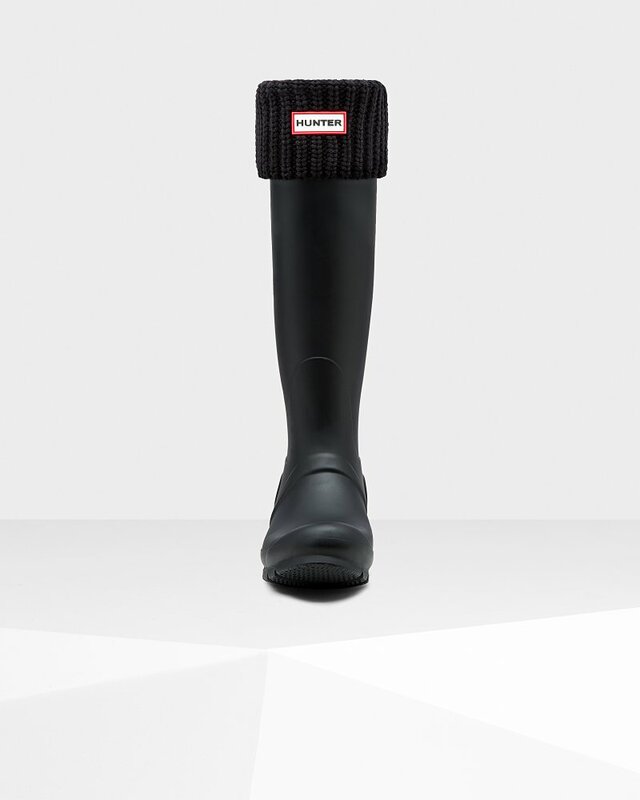 Personalize your Hunter Boots with these warm and snug boot socks. Designed to fit comfortably inside the Original Tall Rain Boot and enhance fit while adding comfort and warmth, these classic black boot socks feature a cozy cardigan knit fold down cuff and Hunter Original logo. Rated 5 out of 5 by jcck from Worth the money I bought these for my Hunter boots and am so pleased with how they came! They’re comfortable, warm, and look great! Rated 3 out of 5 by New buyer from Size is not correct It's too thick to fit into my hunter boots so I don't feel comfortable wearing them all the time, plus the socks are too big for its size hence don't fit on my feet perfectly. Not too happy. Can't return either, so money wasted. Rated 5 out of 5 by Kris from Love this boot sock, so warm! I love these socks. They make the boots winterized and warm enough to wear throughout the season. Especially great for such a rainy/ slushy winter in this city. Rated 2 out of 5 by Anonymous from The straps don’t stay clipped in on the side which is a bit of a pain. But overall the size was true to fit. Rated 1 out of 5 by Kara from Damn boots didn't fit my calves. Bought a pair of Helly Rubber boots instead. Half the price and fit comfortably. Rated 5 out of 5 by Kara from LOVE THEM! So happy to finally have boots that fit me properly.